Most often, the limits employed in diagnostic analysis of high-voltage bushings rely on general rules and limits. They include comparison of test results with the nameplate and/or initially tested values, absolute limits, and trending of empirical data over time. This approach, while useful, has some limitations. It relies on similar or the same limits being applied across different types of bushings, which may miss the early stages of deterioration that a refined model might detect. For example, an often used limit by some manufacturers for power factor values corrected to 20°C is two- or three-times the benchmark value. A limit for power factor of ≤ 0.5% is given in IEEE C57.19.01 for oil-impregnated paper-insulated bushings. For capacitance, a 5-10% increase/decrease in measured values over the benchmark value is used as action limits by some users. IEEE C57.19.01 has a limit for change in capacitance of ±1% based on the initial value. It is important to identify the bushings that behave differently in the same population. 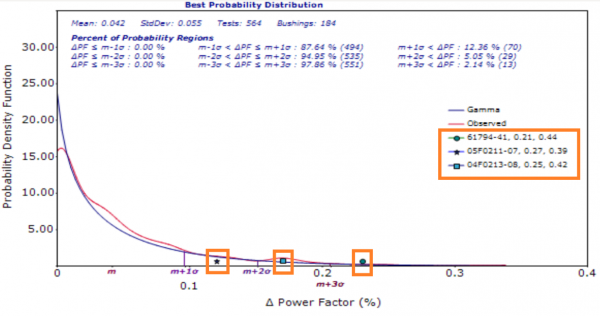 The figure above shows the probability density function for change in power factor of the C1 insulation for a specific population of bushings (same manufacturer, type and voltage rating). The red curve corresponds to the selected test data while the blue curve corresponds to the gamma distribution, which is automatically selected by the tool, in this case, as the best fit of the selected data behavior. Three bushings have been identified (see orange squares along the X-axis) as well as listed with their serial number, and first and last measurement results (see legend highlighted to the center-right). Clearly, the identified bushings, even though they might meet traditional limits, should be given special attention given the deviation from the bulk of this population. The probability of exceeding 3σ is 2.1%, 2σ – 5.0% and 1σ – 12.3% where σ is the standard deviation. Browse our Webinars section for the latest online sessions discussing high-voltage testing. Are you a Doble Client? Contact your Client Service Engineer for more information.